WASHINGTON — Top sci­en­tists and tech­nol­o­gists are work­ing with the Defense Advanced Research Projects Agency to give arms and hands back to war­riors who lose them in bat­tle. Users wear and con­trol, with­out surgery, an advanced pros­thet­ic arm devel­oped under the Defense Advanced Research Projects Agency’s Rev­o­lu­tion­iz­ing Pros­thet­ics pro­gram in 2007. Even at the finest hos­pi­tals in Amer­i­ca today, the solu­tion to a miss­ing hand usu­al­ly is a hook, Ling said, “because mak­ing a hand is thought to be impos­si­ble.” “But is it?” he asked. Not if you work at DARPA, he said. Ling said that dur­ing his first deploy­ment to Afghanistan in 2003, he was frus­trat­ed by being able to help patients sur­vive, but not to com­plete­ly restore them to health, espe­cial­ly if they had lost limbs, eye­sight or brain func­tion. DARPA offi­cials put out a chal­lenge, he said: Make us a hand that looks like a hand, works like a hand and has the per­for­mance char­ac­ter­is­tics of a hand, and that lets the wear­er con­trol it nat­u­ral­ly, with the brain. “Most of the engi­neers thought we were crazy,” he said. “That’s good; it means we’re on the right track. But a num­ber of them were crazy enough to come work with us.” The chal­lenge includ­ed an ambi­tious timetable. DARPA decid­ed to divide the pro­gram into two parts. One group would build the finest mechan­i­cal arm they could. The sec­ond would build an arm-hand com­bi­na­tion con­trolled by the brain. Today, the agency’s Rev­o­lu­tion­iz­ing Pros­thet­ics pro­gram is enter­ing its fifth year, and near­ly $150 mil­lion is com­mit­ted to improv­ing the entire upper-limb pros­thet­ic sys­tem, includ­ing sock­ets and con­trol soft­ware. By 2008, DEKA Inte­grat­ed Solu­tions Corp. had built two gen­er­a­tions of a “strap-and-go” arm-hand sys­tem that users could wear and con­trol with­out surgery. Six users helped them assess the pro­to­types in clin­i­cal stud­ies, and clin­i­cal and take-home tri­al sub­jects logged more than 3,000 hours of use on the sec­ond-gen­er­a­tion DEKA arm. Tri­als includ­ed 26 par­tic­i­pants in a Vet­er­ans Affairs Depart­ment study that used the DEKA arm in three VA med­ical cen­ters and the Cen­ter for the Intre­pid at Brooke Army Med­ical Cen­ter in Fort Sam Hous­ton, Texas. DEKA plans to fin­ish build­ing its first third-gen­er­a­tion sys­tem ear­ly next year for more VA and Defense Depart­ment tri­als. The arm has 10 pow­ered degrees of motion and six user-selec­table hand grips. Over the first four years of the sec­ond DARPA effort — to build a hand con­trolled by the brain — sci­en­tists at the Johns Hop­kins Uni­ver­si­ty Applied Physics Lab­o­ra­to­ry went through three mechan­i­cal designs and gained insight from more than 100 hours of use by six tri­al par­tic­i­pants. The Mod­u­lar Pros­thet­ic Limb had 17 con­trolled degrees of motion at the end of the lab’s Phase 2 con­tract. In June, DARPA award­ed a Phase 3 con­tract so the lab’s sci­en­tists can fin­ish devel­op­ing brain implants that could pro­vide near-nat­ur­al con­trol of the sys­tem. Togeth­er, the sci­en­tists have devel­oped “a lit­tle brain inter­face device, … half the size of your pinky nail, that lays on the sur­face of the brain and cap­tures brain sig­nals asso­ci­at­ed with move­ment of your arms as you’re doing a task,” Ling said. Oth­er part­ners include the Nation­al Insti­tute of Stan­dards and Tech­nol­o­gy, which has fol­lowed pro­gram devel­op­ments to inform stan­dards for med­ical robots. Sev­er­al Army rep­re­sen­ta­tives act as advi­sors and the FDA helps DARPA offi­cials nav­i­gate reg­u­la­to­ry require­ments. The new hand has five inde­pen­dent, mov­ing fin­gers and a rotat­ing thumb. Sen­sors in the fin­gers let wear­ers feel what they touch. Vibra­tion sen­sors in the joints allow them to feel move­ment. Tem­per­a­ture sen­sors allow them to feel hot and cold. 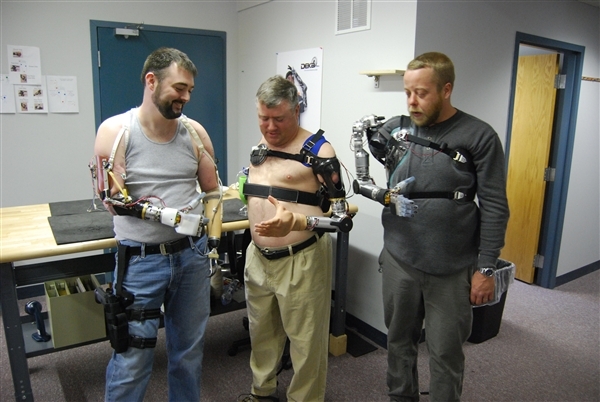 Now, Ling said, DARPA and the Johns Hop­kins lab are ready to iden­ti­fy patients who will test the new mod­u­lar arms. DARPA intends to have the Johns Hop­kins lab run two clin­i­cal sites through 2013 to gain data on brain con­trol of the arm pros­the­ses. The clin­i­cal sites are seek­ing reg­u­la­to­ry approval for devices they will implant in patients to decode motor sig­nals that will move the arm and hand. “What we’re going to do is … put the chip in and then cou­ple it up to this remark­able arm,” Ling said. “What we expect patients to be able to do is all the activ­i­ties of dai­ly liv­ing, such as eat­ing and the like, but also work a key­board. The goal is to gain FDA approval to mar­ket the mod­u­lar pros­thet­ic limbs and to use implantable arrays in oth­ers who have lost con­trol of their upper limbs, espe­cial­ly amputees and stroke vic­tims. “Think about what this tech­nol­o­gy can do for stroke vic­tims, Parkinson’s vic­tims [and] spinal-cord vic­tims, of course,” Ling said. The elder­ly also can ben­e­fit, he said. “Why can’t the 90-year-old man go out back and play ten­nis again?” he asked. “Why can’t the 80-year-old woman go to her great-grandson’s wed­ding, not in some stink­ing wheel­chair and a dia­per, but go there to dance with her grand­son?